This Chapter takes on some steps further along the way towards the controller fragility and performance deterioration issues due to inaccuracies in controller implementation. 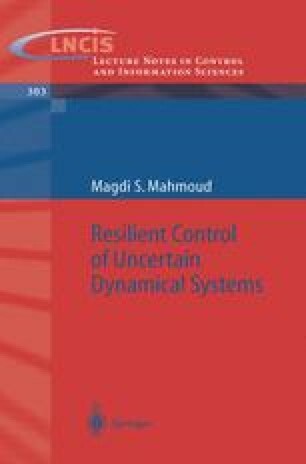 Interestingly enough, it addresses the problem of resilient adaptive control problem for classes of uncertain continuous-time and discrete-time systems with state-delays against controller gain variations. In the continuous case, design results on both norm-bounded and convexbounded parametric uncertainties are derived. In the discrete-case, design results on norm-bounded parametric uncertainties are developed. Adaptive control schemes are constructed when gain perturbation bounds are known and then extended to accommodate unknown norm-bounded perturbations. To complete the design profile, special cases of delayless continuous and discrete systems are provided. All the developed results are conveniently expressed in LMI feasibility problem. It is fair to mention that almost all the analytical developments hereafter are new and original contributions to the field of adaptive control applied to time-delay systems. Results of several simulation examples are presented to demonstrate the developed theory.